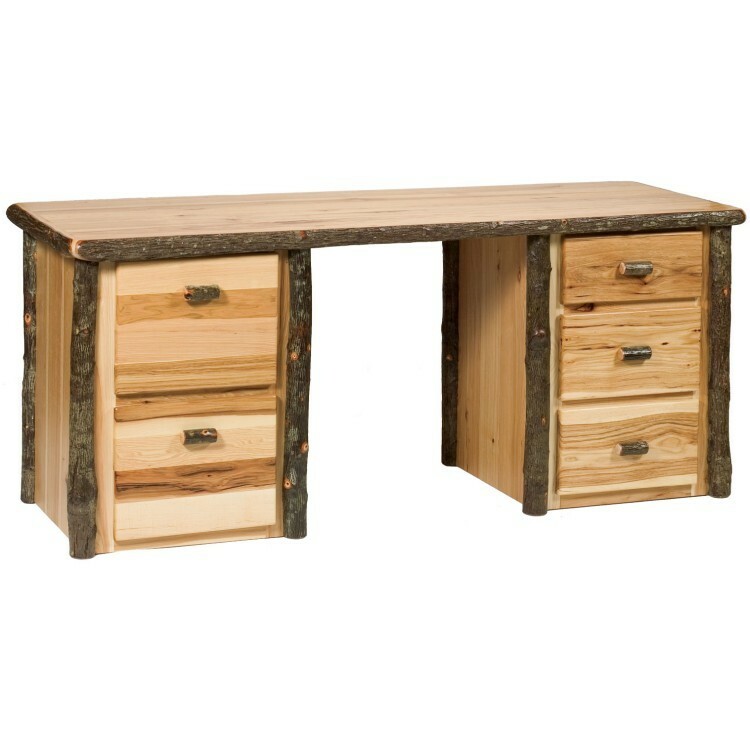 This rustic hickory executive desk with a client overhang on back side will perfectly complete the rustic decor in your home office. It is individually handcrafted and is clear-coated with a catalyzed lacquer finish for extra durability. All Hickory Logs are bark on and kiln dried to a specific moisture content. This rustic Hickory Executive Desk with a client overhang on back side will perfectly complete the rustic decor in your home office. It is individually handcrafted and is clear-coated with a catalyzed lacquer finish for extra durability. All Hickory Logs are bark on and kiln dried to a specific moisture content. All hinges are concealed European style for a clean uncluttered look. Hickory drawer fronts and doors have a .5" overlay and full-extension ball-bearing glides rated to 100 pounds. Bottom drawers are set up for hanging file folders for either legal or letter size folders. Available in Standard or Armor Finish top. Armor finish is an upgrade finish that is made from an oil based urethane. It is applied in a 3 step process that leaves a satin finish and helps prevent scratching and denting. This finish is similar to those found on hardwood floors.